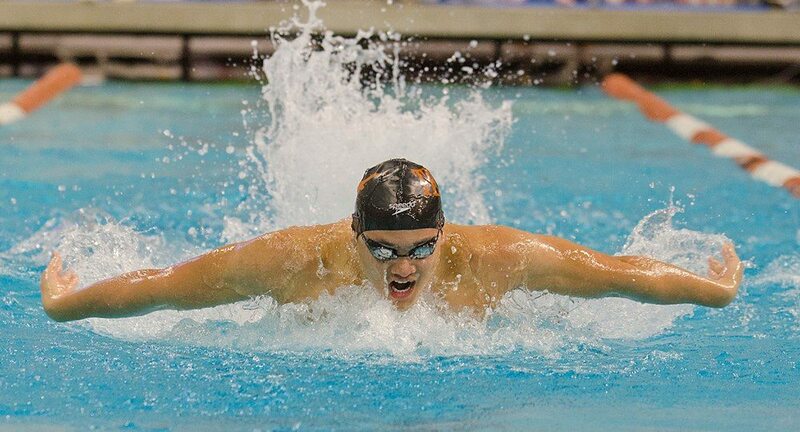 University of Texas swimmer Joseph Schooling set a new Olympic record while winning the gold medal in the 100-meter butterfly at the 2016 Olympic Games in Rio de Janeiro, Brazil (photo courtesy of texassports.com). RIO DE JANEIRO, Brazil — Texas junior Joseph Schooling certainly wasn’t the most well-known swimmer in the 100-meter butterfly. That honor goes to Michael Phelps in any race he enters, and deservedly so. But it was Schooling who emerged from the event at the 2016 Olympic Games in Rio de Janeiro with a gold medal in the event … and a new Olympic record. Schooling held a lead of 0.32 seconds after 50 meters over his nearest competitor — Russia’s Aleksandr Sadovnikov — and won the event in 50.39 seconds, making him the only competitor to finish the event in less than 51 seconds. His time also was a new Olympic standard, breaking the previous record of 50.58, set in the 2008 Games in Beijing by Phelps. Phelps, South Africa's Chad Le Clos and Hungary's Laszlo Cheh all tied for silver at 51.14. Schooling’s gold medal is the first in an individual by a UT swimmer since Aaron Peirsol won gold for the United States in the 100-meter backstroke in 2008, and the 25th gold medal ever won by a Longhorn swimmer or diver. Schooling won bronze for Singapore in the 100-meter butterfly last summer at the 2015 FINA World Championships. The 2016 co-National Swimmer of the Year swept the four NCAA butterfly titles contested in his first two seasons at UT and holds the NCAA, NCAA Championship and U.S. Open records in the 100- and 200-yard butterfly events.